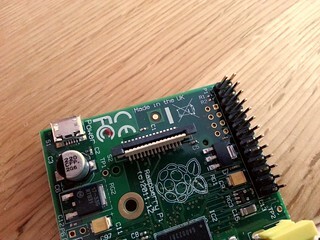 My Raspberry Pi has arrived, and not only is it one of the nice new rev2 hardware revisions, it’s also been manufactured in the UK, which if you’ve followed their trials, you’ll realise is a big deal. Anyway, mine is here, and one short hunt for a spare SD card later I’d got the installation of RaspBMC, a port of XBMC, started. It took probably about ten minutes to complete, with no intervention from me. probably loads more, I’ve only had a couple of hours! Next step will be to get a suitable case. Maybe something custom etched?